Cats can be effective tools to sneak stuff into jail. At the Alagoas state prison in Arapiraca, Brazil, guards noticed an unusual frequent visitor slipping through the gates of the medium-security prison. A little white kitten was often seen on surveillance cameras, slipping in and out of the prison gates on a fairly regular basis. Turns out, it wasn’t just seeing friends, it was smuggling in forbidden goods. Cell phones, drill bits, saws, and other contraband were being slipped into jail by a taped-up kitten. Call it the anti-cat burglar! The facility holds 263 inmates, all of whom are suspects in the cat smuggling ring. However, officials don’t believe that they’ll be able to track down who was responsible for the animal. 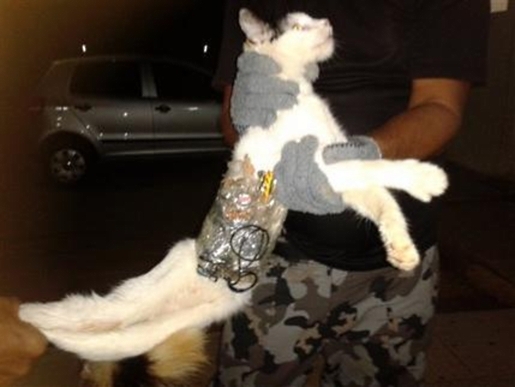 The cat was intercepted on New Years Eve, no doubt on his or her way to give one happy inmate a pretty great beginning to 2013. However, the crooked kitty is not giving up its master quite yet. “It will be hard to discover who is responsible since the cat does not speak,” said one prison spokesman. Maybe a trial before a jury of its peers will change the cat’s tune!